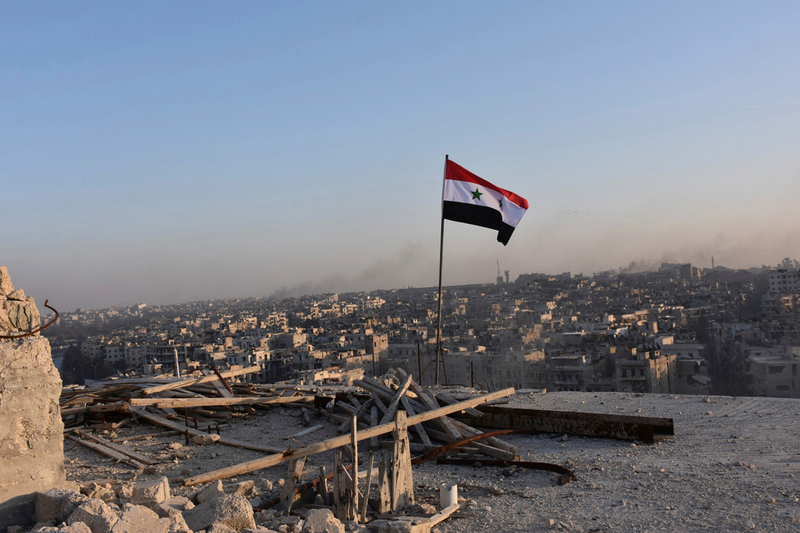 A Syrian national flag flutters near a general view of eastern Aleppo after Syrian government soldiers took control of al-Sakhour neigbourhood in Aleppo. Russia’s Center for Reconciliation of Opposing Sides in Syria said on Dec. 15 it is preparing to withdraw the remaining militants and their family members from eastern Aleppo to Idlib, and Syria’s authorities guarantee their safety. "Under the order of Russian President Vladimir Putin, the Russian Reconciliation Center in cooperation with Syria’s authorities is preparing for the withdrawal of the remaining militants and their family members from the eastern areas of Aleppo," the center said. The withdrawal will be carried out by 20 buses and 10 ambulance cars via a special corridor in the direction of Idlib. The Syrian authorities guarantee safety of all members of armed groups who decided to leave the eastern quarters of Aleppo, the center said in a statement. The situation in Aleppo is monitored through surveillance cameras and drones. After the end of hostilities in Aleppo, what next for Russia in Syria? On Dec. 14, the withdrawal of militants from the city was disrupted as armed clashes resumed. The Al-Mayadeen TV channel said about 5,000 militants and their families were to be evacuated from Aleppo. The leaders of militant groups violated agreements with the Syrian authorities on their withdrawal from the city and resumed combat operations Wednesday morning, but their attack was repelled, the Reconciliation Center said. Still, the Syrian forces observed the silence regime for 24 hours, in line with the agreement with the gunmen. Since late November, Syrian troops and militias have been conducting an operation against armed groups in the eastern quarters of Aleppo. On Wednesday, the Reconciliation Center said the rebels controlled the territory of no more than 2.5 square kilometers.